Rhythm Heaven the Best + is full of cute Nintendo musical mini-games—and one surprisingly depressing one. At first sight, it doesn’t seem so sad. 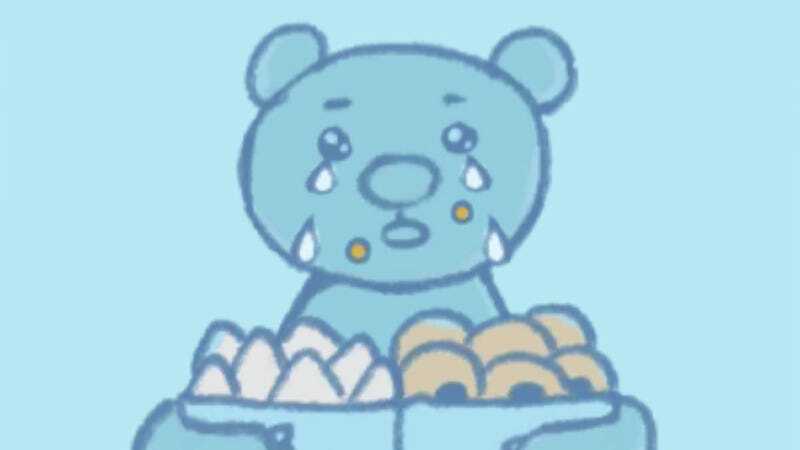 After all, it’s just a blue bear holding two sacks of groceries—one full of doughnuts and the other full of cake. But then he starts eating—popping cake and doughnuts up into the air one after another and eating them on the way down. In the background, we see scenes of him and another bear—his girlfriend—and some of the happy times they have shared together. However, as his smile becomes melancholy and tears brim in his eyes, we learn the truth: The female bear has just dumped him—and hard. This is not a bear who just enjoys his sweets. No, he is a bear who deals with depression by binging on them. As the song nears its end, we zoom out from the bear’s hollow eyes and tear-streaked face—and see that he has become too heartbroken and forlorn to even continue eating. Of course, in the song’s last moments, it is revealed that this has all been a dream—that he is actually asleep while on a picnic date with his girlfriend. ...Though, when you think about it, falling asleep while on a romantic date is a pretty sure way of turning his (prophetic?) nightmare into a reality. Poor guy should probably go stock his fridge. Rhythm Heaven: The Best + was released for the Nintendo 3DS in Japan on June 11, 2015. There is currently no information on an international release.